I'm going to briefly try to recall what I did the last almost-week ... We've been busy! Day 18/Dec 25: I ended up washing and I didn't blow dry. Good for my hair but I didn't care for the result. I think I'll keep blow drying it. 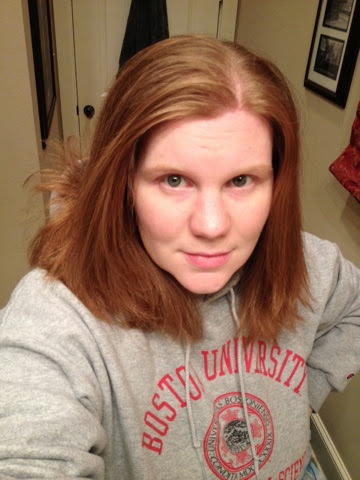 Day 19/Dec 26: Despite not being blow dried my hair still feels more like it used to the first day after a wash! I even wore it down again. Horrible picture but there it be! 7 month olds don't really "say cheese." 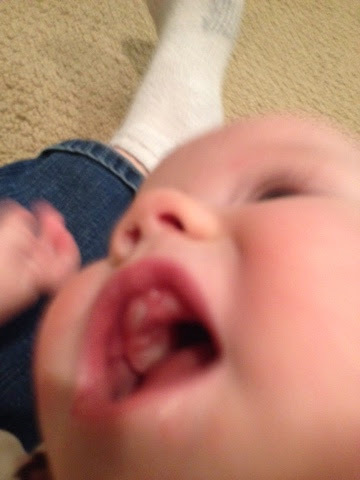 I had to tickle her mercilessly and attempt to photograph the wriggly laughter simultaneously. Speaking of teething, we had an amber necklace for Shelby that seemed so helpful (especially with the drooling) but of course I put it away in such an smart place that I can't find it. So I ordered one which hopefully will be here soon. She's not really grumpy but it does seem to be disrupting her normally very restful and easy sleep. Day 21/Dec 28: Ended up using dry shampoo today. My mom mentioned that I must have washed my hair, ha ha! It really does make a big difference (and travels well). Three weeks no-poo!!! I thought I'd be disgusted and disenchanted by now! Day 22/Dec 29: Starting to get a bit itchy again. Tonight ended up being a wash night and I did blow dry it. Instead of my usual method (since I'm traveling and chose not to bring my peri bottle or spray bottle) I took two plastic cups to the shower. I put baking soda in one and vinegar in the other. The water is much softer here; I'm not sure I could get away with it at home but it seemed to do fine here. I just filled them with shower water right before using them so it would be warm. I probably got more of the baking soda mix on more of my hair than is recommended but I haven't seen any ill effects from one wash. For the vinegar I actually just dipped the tips in and then squeezed the excess out. I didn't even rinse it out. It's true, once the hair is dry you don't smell the vinegar! Woooo no makeup... Immediately after wash/dry. Day 23/Dec 30: Maybe it's the weather, the blow drying, or baking soda over too much of my head but I'm having more static than I have been. I feel so much better with my hair blow dried than air dried. Bought a boar bristle brush. Nothing fancy. It's a round brush and they appear to be real boar with no nylon stiffening bristles. I haven't tried it yet.